Another Canadian Dividend Aristocrat on my watch list is Shaw Communication (SJR.B). This is a relatively new dividend payer and not one of the long standing dividend paying companies like the Canadian banks. The last service from Shaw is very recent as they purchased Global Television from Canwest and cleared all regulatory hurdles. The new television content provides them with 19 specialty channels. The purchase of Global was a big win as competition was present across the major telecommunication companies. The race for exclusive content seems to be on and Shaw has its content. Rogers Communications has some exclusive sports content as well. As the internet becomes even more prevalent for watching content, these moves should prove to be profitable. Shaw also owns a wireless spectrum and is working hard to enter the fierce and lucrative wireless business. It has already spent a significant amount of money and we should see them enter the wireless segment later this year or in 2012. Most recently in the news, the torch was passed down to one of the sons to take control of the company and yesterday, the company announced they are cutting nearly 4% of the workforce across Canada. It should be seen as positive news for the investors. As I mentioned above, Shaw is a recent dividend payers but it has demonstrated to pay a comparative dividends to its peers while continuing to invest in their business. 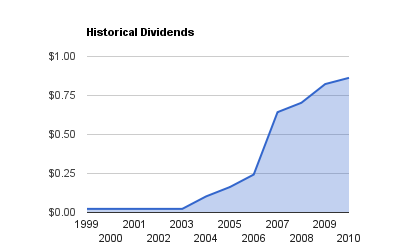 I do like that it pays its dividend monthly as it allows for a faster compound growth. 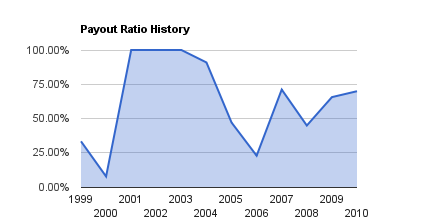 For 2011, their payout ratio is on the rise. It's estimated to be at 92% based on expected earnings and its current dividend payout. That's quite high and above its competitors. Comparatively speaking, its Canadian competitors are all doing better except one. A good payout ratio in the telecom industry should be around 50% to allow them to improve their infrastructure and stay competitive. 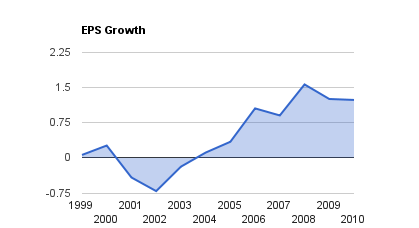 The rise in EPS is consistent with other telecoms and I believe it signifies the turning point for telecoms when services (internet, HD cable, and wireless) were not deemed a luxury but a necessity. I have written that Telecoms are essentially utilities and I just noticed that Telus is categorized as a Utility while Shaw is categorized as a Communication & Media company by the Globe & Mail. Telecoms have regular subscriber paying monthly (and hardly defaulting) making them regular cash cow. They may run into hurdles from time to time and you need to watch for that for possible entry points. I believe that Shaw is going through one of those hurdles and it's worth monitoring it as it positioned itself strongly to benefit and leverage its assets in the future. The wireless segment will be tough to crack but they have subscribers to offer discount to. All they need to do is wow them and offer a stable network. Rogers and Telus made 40% of their revenue from the wireless sector in the past and Shaw could reach that. Readers: What do you make of Shaw Communications?